Since I transitioned from media/film/audio production to a job in manufacturing/engineering, I’ve noticed or been the cause of some neat re-purposing from the film industry to the manufacturing industry. 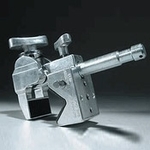 The robustness demanded by the film industry has made certain specialized products very useful in manufacturing tooling. 177,000 flex cycles rated, Polypropylene filler thread for strength, 176 N breaking strength (about 40 pounds)…It was everything I wanted, at about $0.50/foot. It’s typically found in professional audio as a lavalier or microphone cable. If it’s good enough for daily use in a TV studio or on a rainy film set, it’s good enough for daily use in a manufacturing environment. Next, the Manfrotto Magic Arm comes out. I laugh. Too bad the demonstrated product didn’t fit our needs. Not duct tape, not Duck tape, but a Gaffer’s tape. From temporary fixturing to guarding fingers while deburring, I use the stuff almost daily…Just as I would on set. It’s neat to be able to use mainstays from one industry in another…At some point in the future, I will be able to talk a little about how film industry know-how benefits work with industrial vision systems. 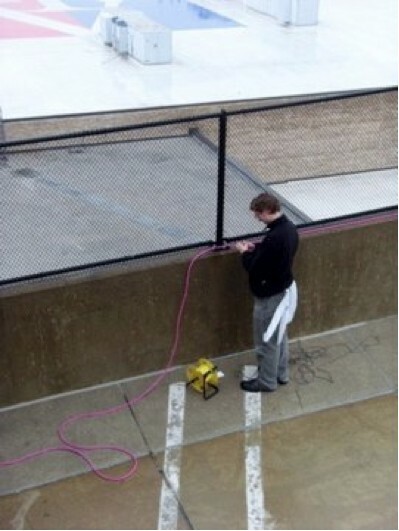 30 feet, 50 feet…100 feet? Does it stop? So, the first prototype pictures of the Supertechno 100 are in the wild…Dollygrippery has them. A 100 foot telescoping camera crane…This in and of itself is an amazing feat, given the relatively recent development of even 20 foot telescoping cranes. I will be curious to see the thing in use, or at least at a trade show. The Strada trick of just lifting the operator, steadicam rig and all probably is impossible, though would be a wild ride for the operator. My money is on a stabilized head like the Scorpio or Chapman G-3 over the Techno Z head or other standard heads for most uses, given the inherent flexing. Buy quality, buy once…Or adventures in overkill. 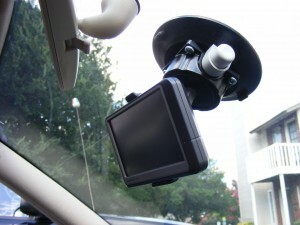 I recently made the mistake of buying a replacement suction cup for my GPS unit. 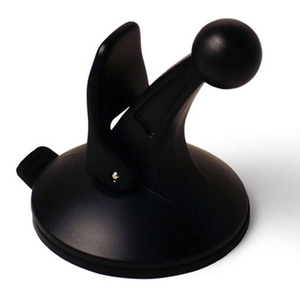 The first one broke when the suction cup rubber detached from the rest of the device. The second one promptly broke as well. In the same spot. I broke two of these. The thing about the film industry is that work invariably invades one’s personal life. Film equipment is useful to have around the house, not just on set. I’m not the only one. 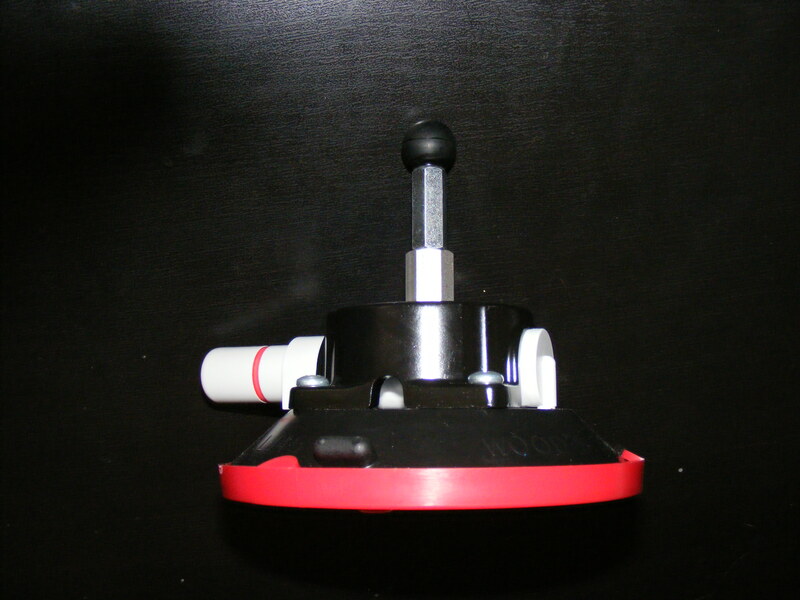 A 4.5 inch diameter suction cup, thread adapter, threaded riser and phenolic ball. The mount in a car. My neighbor has something odd on their car antenna. I have to add some loctite to the threads to keep them in place, but the suction cup will stay on a window for…ever. The joy of never having to buy another badly made piece of crap? Priceless. Nothing says Manly Man quite like pulling a pink stinger (yeah, pink), with a white dish towel hanging out of one’s back pocket. 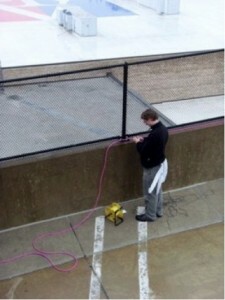 There comes a time in any film student’s days when one does something stupid. That being said, I’m finishing a graduate film degree, so I have to do stupid things smartly! 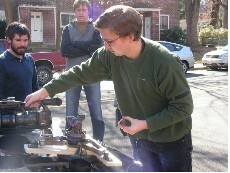 Putting a car-mount on a car during short film managed by students. Letting the actors drive the car (though they were competent, and safety-aware). Mixing the car scenes from the back seat. 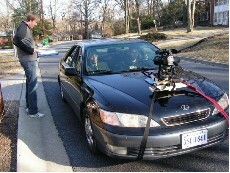 Letting the production use my car. Making sure I was working with smart, safety-aware people. Staying on empty residential streets. Over-engineering the hell out of the thing. My car had over 200,000 miles on it at that point. So, the problem was: How to mount and EX-1 to the hood of a car. I like to think that I did stupid in a smart way. It was over-engineered and strapped to the frame of the car. The mount could hold a Genesis on the freeway, risking only high-vibration due to a single-point rig, and the risk of an imploded hood due to weight. But it wouldn’t fall off.